The 670,000 square foot Tampa Bay Times Forum is the official home of the Tampa Bay Lightning. Encore Broadcast Solutions has been a dedicated partner with the Tampa Bay Lightning by providing AV equipment, rentals, support and installation for over 15 years. When the center hung display system for their in house entertainment was replaced, our original installation of an Echolab switcher for their SD-SDI system needed to be enhanced. Encore was contracted to provide the character generator and routing system to upgrade to HD-SDI and also to serve as engineering counsel. 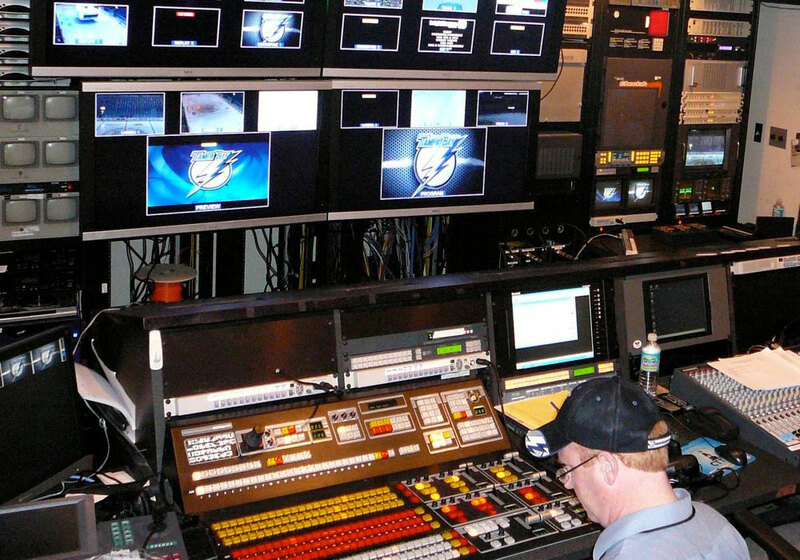 The impeccable design and seamless integration during the original SD-SDI install made it possible for the Tampa Bay Lightning team to install the HD upgrade themselves while our engineer was on site to handle coordination. For video capture Hitachi’s most economical, high-performance HDTV production camera, the Z-HD5000 was used as the fixed camera for center ice shots and also for the camera that weaves back and forth when the players skate. A Panasonic AW-HE120 HD/SD pan/tilt/zoom camera was used underneath the center home display to provide shots for center ice face-off to deliver the highest quality image. In the control room a Tightrope ZEPLAY was incorporated for replay. It captures multiple angles of replay ready to air in seven frames. The built-in server with four bi-directional channels lets you see all four angles as they record. This provides the user with all content ready for cue and go! This is then tied to the HD-SDI Ross Carbonite 2M 24 input switcher with the absolute latest technology for optimal performance and unprecedented production power. Other equipment highlights include replacing the I/O cards to handle HD and also incorporating a Cobham Messenger 2 Transmitter Enhanced (M2TE). Using the Cobham transmitter allows two JVC GY-HM790 HD camcorders to be used wirelessly in the facility for in game promotions. Encore recommended this because the Cobham provides the least amount of lip sync issues between the house audio and the video signal from the camera and can be used wired or wireless. Encore Broadcast Solutions continues to provide support to the Tampa Bay Times Forum facility and the Tampa Bay Lightning for any future endeavors. We always provide superior equipment and unparalleled service to ensure a happy production team. Most importantly, we want to help all of the guests feel the audio visual impact to maximize their entertainment experience whether from home or at the Forum.